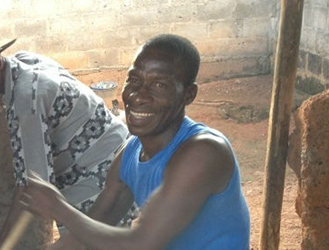 The first chocolate bars manufactured in Depa, a village of about 400 situated about 5 km from Issia, a major cocoa growing town in Côte d'Ivoire. 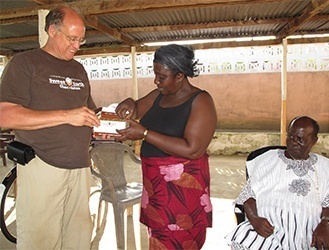 Thanks to generous donations, Project Hope and Fairness has been able to help David Logbo Zigro build a small factory that roasts, cracks, winnows, grinds beans and then converts them into chocolate. This is a mélangeur, designed to mill the cacao and sugar particles to 12 microns. The result is smooth chocolate that melts in your mouth! Thanks to a $3500 donation by Splash Cafe, Inc. of San Luis Obispo, we are now in the last stages of completing the Depa Project! This is a picture of bringing 220 3-phase from the rice mill that we built in 2013 to the three chocolate-making rooms. The Depa Project: The broyeuse or grinder gets a room all its own. The base is being cemented in as the machine, which grinds cocoa nibs into a paste known as cocoa liquor or chocolate liquor or Kakaomasse, vibrates a lot and needs to be well fixed to the ground. It's mid-December, 2017 and the Pezoan factory is pretty much done. Next, we have to raise $3,000 for electrification, $10,000 for the rice hulling machine, and $25,000 for the chocolate machines. 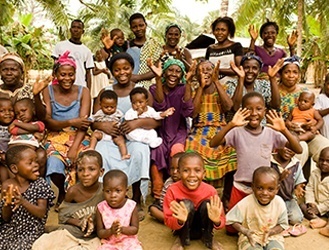 Our story is the story of African cocoa farmers. Work we've done since our founding in 2006.